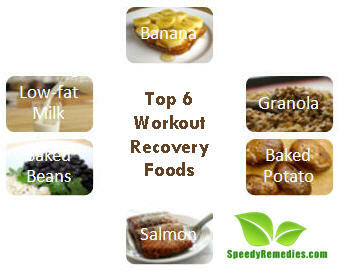 There are certain foods and drinks that can help you recover quickly after a good workout. They are particularly useful for endurance athletes as their bodies require foods that replenish glycogen (it is made of glucose) stores and assist in the muscle and tissue repair and rebuilding process. Plus, they help speed up your progress. Usually, it is suggested to have about 4:1 carbohydrates to protein ratio to maximize insulin production without slowing down digestion. Protein is essential because it is made up of amino acids that repair muscles as muscle fibers tend to break down during exercise. However, you cannot rely solely on protein because it fills your stomach but does not refuel your muscles. Thus, you need carbohydrates as well in order to restore the muscle glycogen. It is believed that the recovery begins within the first half an hour following exercise. There is an increase in enzyme activity during this time that encourages faster glycogen replacement. Moreover, it makes the body efficient at building proteins required for repair of fatigued muscles. Though there are several recovery drinks, protein bars and supplements available for this purpose, still people prefer to have whole foods that are natural and beneficial for overall health. However, as the body is in a stressful state, you first need to return to a calmer state so as to prepare your system to digest these foods. Banana is popularly taken as a good workout recovery food because it has a low fructose to glucose ratio. When combined with peanut butter, it gives the 4:1 carbohydrate to protein ratio. Thus, you can peel a medium-sized banana, spread two tablespoons of peanut butter or almond butter on it and eat it within 30 to 60 minutes after strenuous exercise. Furthermore, you can prepare a recovery drink by combining banana, milk, and yogurt. Besides, you may opt for other low fructose containing fruits like pineapple, avocado, orange, apple, strawberries, blackberries, cherries, etc. You may prepare a fruit smoothie, too. Having low-fat milk is the best way to recover from an activity. It is even considered better than sports drinks. So, you can have milk and whole-grain breakfast cereal. Another delicious option is to take low-fat chocolate milk. It has the right carbohydrate to protein proportion. This is another good on-the-go recovery food. You can have a bowl of granola with a cup of low-fat milk or Greek yogurt. Granola bars make good energizing snacks. You can have this high-protein fish with brown rice and veggies as a workout recovery meal. Being rich in omega 3 fatty acids, salmon is also healthy for your heart. Plus, it contains vitamin A and B vitamins. Spinach and sweet potatoes are also considered beneficial. In fact, spinach is useful as a pre-workout food, too, because it boosts strength. As for sweet potatoes, they are rich in complex carbohydrates, and provide fiber, protein, and vitamin C.
Combination of baked potato and low-fat cottage cheese serves as a great carbohydrate-protein food that facilitates recovery after a workout. Moreover, baked potato is a good source of iron, potassium, niacin, folate, vitamin B6, and vitamin C.
Another effective way to help repair muscle damage and include carbohydrates is to have a cup of black beans along with brown rice. In addition, black beans contain antioxidants. They help lower blood cholesterol and reduce the risk of coronary heart disease. When combined with brown rice, they make complete proteins. Needless to say, rehydration is also a must after an intense workout. So, drink a decent amount of water. You can also have coconut water as it is considered as a carbohydrate-electrolyte beverage. Plus, unless you are a serious athlete, you need not fret over the ‘one-hour’ window of opportunity.